Modern Washers and Dryers at Great Prices What Are the Different Types of Mattresses? With chilly temperatures and big TV events on the way, there will likely be a lot of time spent with your eyes on the screen. Whether you're a regular binge-watcher, a 24/7 news junkie, or a TV sports enthusiast, you've probably considered adding a home theater system to your living space. Years ago, having an affordable home theater didn't seem possible. Fortunately, today almost anyone can create a space where they can enjoy everything from live events to cinematic favorites in private and comfortable surroundings. Below are some of our favorite home theater ideas to help you get started on creating an oasis that you, your family members, and every guest will love. In some cases, families have a basement room or den that's practically crying out to be turned into a home theater. Other people may find that they prefer to turn a portion of their living room into a home theater. Whatever you decide, be sure you have the room to make your home theater dreams a reality. A home theater doesn't have to be large, but it should be big enough for home theater equipment, seating, furnishings, and decor. Obviously, you want your home theater to have the best sound and screen quality possible. The only way to achieve that goal is to buy the best equipment you can afford. At Badcock Home Furniture &more, we offer home theater systems in a variety of sizes. Not only are they geared toward giving you an amazing audio and video experience, but they're also built to hold up for the long haul. As an extra tip, be sure to measure your wall space before deciding upon a home theater system to ensure it will fit. Your home theater doesn't have to include any special type of seating, but it can. For example, some home theater seating consists of large armchairs that recline. This gives you the luxury you want that you could never hope to get at the local movie theater. Not sure that's the best solution for your family's needs? You could always invest in a sectional sofa so you have numerous seating options. A bonus to choosing a convertible type of seating is that you can change it up as needed. Beyond equipment and seating, you'll want to add some appealing home theater decor. Explore everything from lighting to wall hangings and have fun creating the perfect atmosphere. Having trouble getting started with a design idea? Think of a theme and then buy home theater decor that fits into the theme you decided on. This helps even non-designers quickly come up with the right additions to make their home theater areas a perfect addition to their space. Why Wait? Give Yourself an Affordable Home Theater Today! Don't spend another minute wishing you had a home theater when you can have one for yourself and your family members in no time. 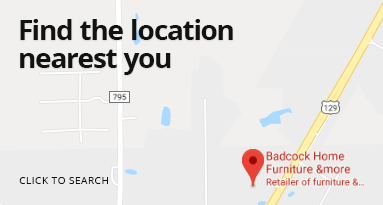 Feel free to stop by Badcock Home Furniture &more to explore our home theater systems and ideas, or browse online to pick from a host of home theater solutions.